We homeschool our two children, and have for about eight years now. My experience has been just the opposite in every category mentioned. First, she talked about the physical and emotional health of the children. Physically, my children are sick far less than our neighbors, who go to public school. As far obesity in homeschool children, I have never seen any studies on that subject. I would be very surprised to hear of any link. In the last eight years we have been involved in at least five homeschool organizations, and met hundreds of homeschool kids, and certainly have not noticed an obesity problem. As to the physical education, apparently Frisbie isn’t aware of the State regulations that govern homeschooling, and require physical education. Over the years, our children have been involved in soccer, swimming, baseball, basketball, archery, hiking and roller skating, mostly in groups of other homeschoolers. Our children seem to be very fit. Frisbie’s letter suggests a link with homeschooling leading to obesity, leading to diabetes. I assure you that no such link exists. Obesity is a problem in our culture today, but if I have observed a difference between obesity rates in homeschool students versus public school students, it is the homeschoolers who appear more fit. Frisbie also talked about the drama, jealousy, and conflict as a good thing. I disagree. These rumors and conflicts cause anxiety that distracts them from their education, and may even lead to depression, a sense of worthlessness, and a loss of value as a person. I think that there is more than enough anxiety in most families to teach kids to stand up for themselves without bombarding them with peer pressure in the public school system. Lastely, Fristbie brought up socialization. I have heard about this concern as long as we have been homeschooling. Right now, we belong to two local homeschool groups, and get together with other homeschooled children on a regular basis. Our children each have several friends, go to youth groups with a number of other children, some homeschooled and some not. My daughter is involved in dance classes with other children. They each of numerous opportunities to get together with other people each week. For some reason, there is a common misconception that homeschoolers live in cocoons and go through their year without any contact with the outside world, but that’s just not the case. We homeschool because we want the very best education for our children. We purchase our own curriculum, the same curriculum that many private schools use, and we can spend one on one time with each of them, something public schools just can’t do. In fact, a number of colleges are actively pursuing homeschooled students because they find they do quite well in college. So I disagree that homeschooling is dangerous to our kids. In fact, I find a number of advantages. So while it might not be for everyone, for those that can, you will be glad you did. Sunday’s worship service at the Almond Union of Churches was a little different than normal. The heater was not working in the Sanctuary, so we set up chairs in the Social Room. It was nice and cozy, and we had a good service, but there is something less formal, almost less holy, about worship in the Social Room. Yet as I was thinking about this, I am reminded that when we come to faith in Jesus Christ, we are given the Holy Spirit as a deposit guaranteeing our salvation. The Holy Spirit is given freely to all who believe. So if we have the Holy Spirit, then everywhere we go, the Holy Spirit goes with us. Therefore, wherever we are standing is Holy ground. It doesn’t matter if we worship in the Sanctuary, or in the Social Room, or if we are unable to attend for any reason. The Holy Spirit is still with us. And when we go to a place, we bring the presence of the Holy Spirit with us, and that place becomes Holy ground. When you are sitting to worship, that is Holy ground. But when you are sitting in a restaurant thinking how slow the service is today, you are still sitting on Holy ground. When you are standing in line at the grocery store, thinking of all the things you have to get done this afternoon, you are standing on Holy ground. When someone comes to complain to you for the umpteenth time, you are standing on Holy ground. By virtue of your faith in Christ Jesus, you are Holy. And where you go becomes Holy, because you bring the Holy Spirit there. Many thanks to each of you, your faithful reading of this blog has put us over 1800 page views. I am very thankful for each of you. I know that you might not agree with everything you read here. I do ask that you at least think about what you read here, compare it to what you believe so that you better understand what you believe. And compare it to scripture – that’s the model we see in Scripture. When Paul left Thessalonica after they rejected his message, he went to Berea. While there, he found the Bereans of more noble character then the Thessalonians, because they listened to everything he said, then studied Scripture to see if it was true. I urge you to develop the same habits in your lives of faith. Listen to everything, and then study Scriptures to see if it’s true. Whether your mind is changed or not, at least you will know why you believe what you believe! Yesterday I talked about American Christianity becoming an enterprise. How do we get back to the church as a true fellowship lived out in the early church? I heard a statistic yesterday that stated 90% of the Christians in America live just like their unbelieving neighbors. There is no difference in their hobbies, their TV viewing habits, their lifestyles. They are completely conformed to the ways of this world. Yet Scripture clearly states that we should leave the ways of this world to the worldly. That instead, we should be looking to the Holy Spirit, and being transformed by the renewing of our mind. This might not be the easiest to understand, sometimes Paul isn’t, but it does seem clear that we can’t live like we did before coming to faith, and we can’t live like those with no faith. Yet in America, the statistics suggest that 90% are living like they did. Their faith has made no difference in how they live. Perhaps the way to find true fellowship in our churches again is to renew our minds daily in the Word of God, to be transformed into the image of God, to strive to righteousness and holiness, and to completely leave our old selves behind. Congregational Transformation - What's the problem? I have begun reading a new book on Congregational Transformation, by David C. Laubach, and the very first line in the first chapter really caught my attention. I was thinking about this quote. I am not going to speak to the rest, but the idea that American Christianity is an Enterprise is an interesting thought. Enterprises make a lot of money, and while most of our churches are struggling, American’s spend amazing amount of money on Christian “accessories.” Everything from Bibles and devotionals, to jewelry and T-shirts. An enterprise has certainly been born out of American Christianity. The task at hand, is how do we return to the original idea of fellowship. Churches all over America have tried every program imaginable, only to find what Willow Creek just admitted, that programs don’t work. We’ve jumped at the small group idea, and found that overall, small groups make very small fellowships. Overall, we aren’t much closer to the idea of fellowship in our churches. So what’s the answer? I don’t know. Any ideas??? Just a short thought for today – are you listening? Or does God occasionally have to use a brick? Everywhere you seem to look you see people predictions for the New Year. I have one person say that we will have a terrorism act on US soil, another say that a major recession will come, another said that weather related incidents will top the years stories. Who knows what will come? I guess none of us do, really. But it can be fun to guess. God will still inhabit the praises of His people. There will still be God-anointed preaching. God will still pour out blessings upon His people. There will still be room at the cross. Jesus will still save the lost. There may be a lot that we can’t know – but know this – while several things may come up that may surprise us, nothing that happens will surprise God. Trust in Him completely, be totally dependant on Him, and He will see you through. On Christmas Eve, following our Candlelight service, I was handed an envelope from one of the children in our church family. It was an offering envelope that was colored and drawn in pencil during the service. The drawings were all original artwork from Olivia Ormsby, a six year old in our church. I thanked her sincerely and stuck the envelope in my pocket as I continued to greet people. When I got home and pulled it out, I chuckled a little when I gave it a good look. Then I noticed that it was sealed, and opened it up, wondering if there was anything inside. To my surprise, there was, it was the picture you see here. 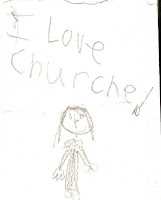 It was the drawing of a young lady, and the words, “I Love Churche”. I decided that I was going to keep that one. And the each day as I see it, it brings a smile to my face. I was reflecting on that a little bit, and I got to thinking that I can’t remember the last time I heard an adult tell me they love church. I hope we do! I know I do! So the idea came… Why not invite people to tell me they love church, and why they love church? We’ll share the results in a newsletter, and on this blog in a month or so. 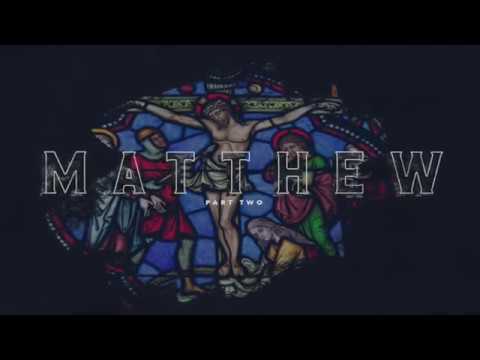 What are you going to do with God? As we begin the new year, I would like you to ponder this question. As I see it, there are only three things that we can do. We can reject God, and pretend He doesn’t exist. Maybe you’ve had something tragic happen and you blame God. Or perhaps out of that experience, you don’t think a God could exist because He bad things to happen. So you just ignore Him and pretend He’s not here. We can set Him aside until we really need Him. Most people inadvertently choose this one. This is when we wait till something terrible happens, then we call on Him, usually with one of those promises that not even we can expect us to keep – O Lord, if you’ll get me out of this one, I promise I’ll… Most of us have made one of these before. We can let Him be the God that He is. We can make him our God. We can live our life in the center of God’s will for us. The first option is very popular, but feeds off the notion that ignorance is bliss. We all know better, ignorance is ignorance. The second option is a compromise. We will admit God is real. But we won’t call on Him unless we really need Him. But doesn’t that try to make us God over Him? If we tell Him to leave us alone unless we call, we’re placing ourselves above Him. Only the third option can allow God to be who God already is. And God doesn’t need us to be who He already is. But when we acknowledge Him, and we seek His will, He will pour His blessings upon us. The neat thing is, it doesn’t matter what we’ve chosen in the past, or even why we’ve chosen it. We can choose again now. And God will rejoice at our letting Him be who He is – He is our God. As we begin the new year, I would like to share a thought I received from Bill Schaaf, the president of the Solid Rock Riders, a Christian Motorcyclist's Association club in Hornell. Bill received this from another CMA club president, Dave VanderKlay, of Crystal River, Florida. If we look into God's Word we see a word like 'time' over and over again. Often the Bible says, "At that time the Lord. . ." or "Some time later. . ." or "In due time. . ." You see God has His own time table for things to happen. I think one of the passages that so plainly sends this message can be found in Ecclesiastes 3. Read these words, and think about them. Remember God has all things in his hands and has planned them according to his time schedule. Not much or at least surprisingly little is controlled by us. Don't misunderstand me, we are responsible for our actions and can make good decisions or bad decisions and in that sense can control areas of our lives and the results of many things depend upon our decisions. What does the worker gain from his toil? I have seen the burden God has laid on men. He has made everything beautiful in its time . He has also set eternity in the hearts of men; yet they cannot fathom what God has done from beginning to end. I know that there is nothing better for men than to be happy and do good while they live. As you approach 2008 remember that the Lord goes before you. He has already set the course of your life and it will go well with you when you walk with Him. Will you allow yourself to keep in step with the Holy Spirit this coming year? Will you listen to the counsel of his Word? You will be blessed beyond what you could ever ask or imagine when you keep trusting in Him. When I struggle with my weakness I must remember Paul's great reminder in Phil 4:13 "I can do all things through Christ who strengthens me." (NKJV) For that to be true however I have to walk in His will for my life. Walk with the Lord in 2008 and trust it will be a great year.